Submitted by witness on Friday, February 8, 2013. LOCATION DETAILS: I've described the location as best I can. Follow snowmobile trail from Roudolph Ranch to Traverse City and turn around at first road crossing after entering highwire clearing. My wife and I rented a snowmobile for the day after Christmas 12/26/2012 from Roudolph Ranch near Traverse City MI. Our first exploration on the trip were the trails from the ranch to Traverse City. We traveled through some forest to a high wire clearing that we felt had too much rugged terrain to continue. We came to the first road in the high wire clearing and decided to turn around. I was driving and my wife was riding in the passenger's seat. After turning around I looked across two hills from which we had just come and noticed what appeared on first impression, to be a cross country skier, 200 yards away, coming down the second hill away from us. Immediately many things bothered me about this cross country skier. First, it was male and it was extremely tall, maybe 8 to 9 feet in height. (It was very male because of its wide shoulder to slim waste shape) Second, he appeared to traverse the steep down hill slope like a down hill skier attacking the slope in parallel skier motions but in very long foot steps instead of sliding skies in downhill parallel motion. No skies were noticed. Third, and most puzzling, was that the figure was dark, dirty rusty, red from top of head to bottom of foot except for the face which was jet black. Finally the figure appeared very unnatural in movement. The entire sighting lasted a total of maybe 5 seconds. As I drove back over the area where I saw the figure I looked intently for cross country ski tracks. I found none. We also did not come across a skier and the area at the bottom of the hill dumped into a very thick wooded area blocked by a barbed wire fence. At the time I thought about stopping and looking for foot prints but was afraid of asking my wife if she saw what I thought I had just seen so I moved on. Whatever I saw bothered me all day. Later in the evening I asked my wife if she noticed the cross country skier which I had seen. She had not seen the skier. When I walked her through the event and told her that I think I saw a Bigfoot she just laughed and continues to laugh at me today. The sighting has continued to bother me over a month later. I'm convinced that what I saw was too tall, was not clothed naturally, and moved too unnaturally to be a human. OTHER WITNESSES: My wife was there but did not notice the figure in the 5 second window. TIME AND CONDITIONS: Appoximately 10:00 AM. Overcast skys. Clear weather. Visiblity over 1 mile. ENVIRONMENT: MI forest. High Wire clearing, Hills maybe 50 to 100 feet in height, 6 inches snow. The witness shared an amazingly detailed account of his experience. He described what he first thought was a cross-country skier crossing the trail behind them. As he stared at the figure, he noticed that if it were a skier, it would be male due to its body shape: very broad at the shoulders and narrowing significantly at the waist. He was also very tall, "like Shaquille O'Neal size." The witness noticed that the figure must have been wearing a ski hat due to a cone like shape of the head. What seemed strange was everything the figure was wearing was the same color. His hat, coat, gloves and pants were all a dark, rusty red glistening in the light. Where the eyes and nose would be was very dark to black. He said, "I thought it was a skier at first, but then I didn't see any skis! Maybe a snowshoer? No! No snowshoes! Then it was gone!" While trying to rationalize what he saw, many thoughts went through his mind. He thought it would be very strange for someone to just be walking around in the area. He realized at this point that he must have seen a sasquatch. The witness resides in Seattle, Washington and is an avid fly fisherman who is very familiar with wildlife sightings, including grizzly bear. "This was not a bear, it was bipedal, it walked upright like a man, taking huge strides," but its arms were long, hands falling at or below the knee. The witness watched the figure cross the trail and disappear over a ravine into a cedar swamp. 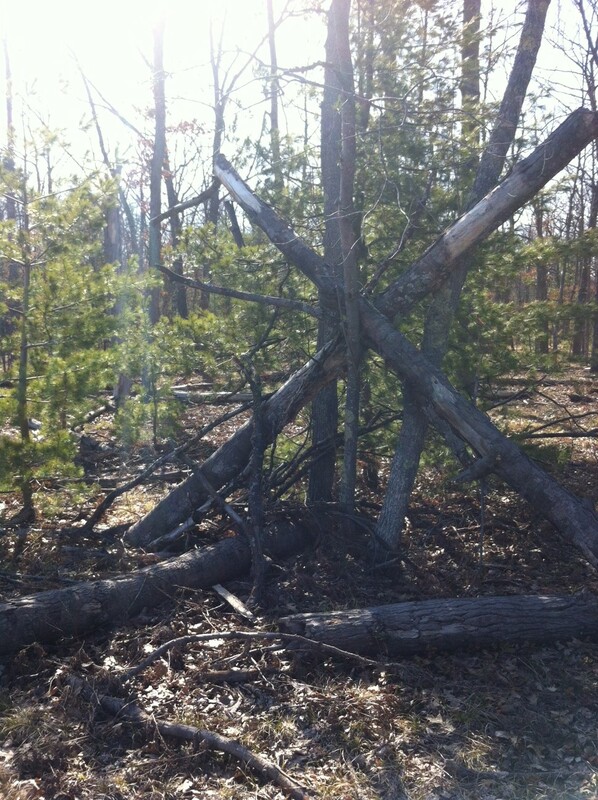 The witness had to travel back over the area where the figure crossed, but he did not want to stop and look for tracks. His wife was on the snowmobile with him, but she did not see the figure cross the trail. The witness did not tell his wife what he thought he saw until later that evening and he has only shared this incident with two other people. It is about 5'10" at the center. 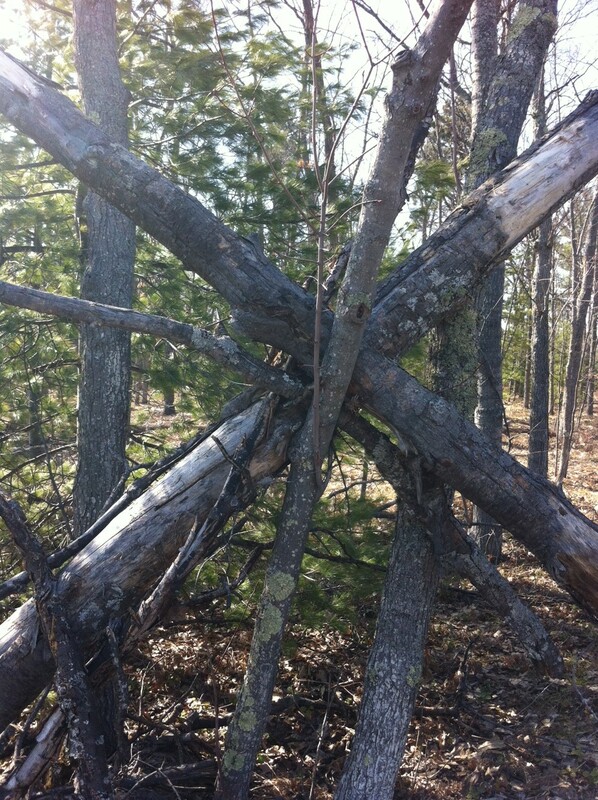 These are trees in this structure. This was just off the power lines. I drove the power lines for about a 1/2 mile from a main road. I could see this structure from my car right at the tree line.